Welcome to The Working Centre Catalogue where your purchases help to support the good work being done in our Community Tools Projects. This is a local catalogue – it’s online to help you purchase items we make in The Working Centre's projects. Many of the items we create in our Community Tools Projects are available for purchase on this page. Items can be picked up at either The Green Door on Market Lane, or at the Queen Street Commons Café in downtown Kitchener. Books can be delivered to you by post. As The Working Centre’s Community Tools Projects have grown and matured, we have seen them become productive enterprises. These enterprises are able to provide support for The Working Centre’s other projects, while fostering inclusion and contributing tools to our community. To describe this, we have been building a concept of Community Enterprise: combining social enterprise with community service. To learn more, browse through the booklet to the right and take a tour through our projects. 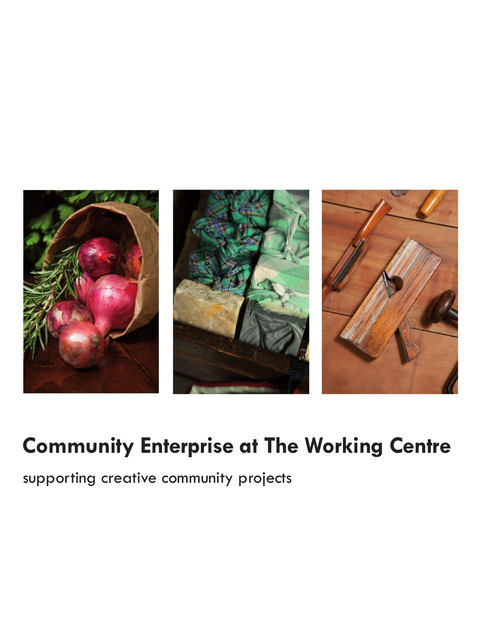 The Working Centre is a non-profit, community-based, volunteer inspired venture that seeks to give individuals and groups access to tools and opportunities to become involved in the building of community in Kitchener-Waterloo. The Working Centre's Community Tools Projects combine work experience, skill building, recycled materials, and opportunities to positively contribute in community. Our Community Tools projects help people access affordable furniture, housewares, food, clothing, bicycles, computers and other practical resources. There are more items available in our Community Tools projects – feel free to visit us in person; more information is available on our Community Tools page of this website.